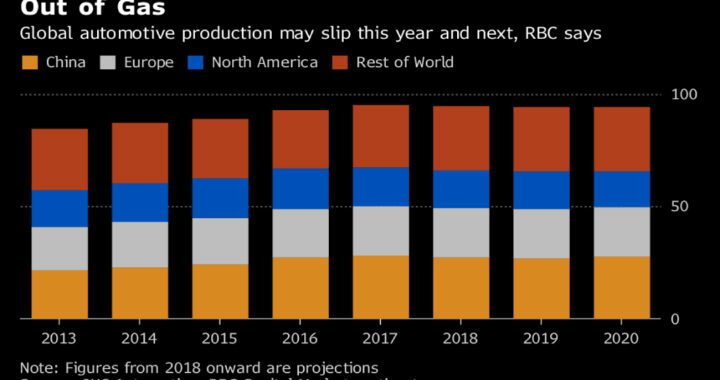 The global auto industry is poised for its first sustained production drop since the financial crisis, according to RBC Capital Markets. Worldwide light-vehicle output fell 2.9 percent in the third quarter and probably will decline about 4 percent in the fourth quarter, analyst Joe Spak wrote in a report Wednesday. This will be the first back-to-back industrywide drop since 2009, he said. Automakers probably will produce about 94.6 million vehicles this year, down 0.6 percent from 2017, according to RBC’s estimates. The analysts are projecting output will drop again by 0.4 percent in 2019, with tempered growth resuming in the following years. The World’s Biggest Auto Markets Are Flashing Yellow and Red. Some of the world’s biggest auto markets may be reaching the end of the road for growth. After almost every major carmaker posted declining U.S. deliveries in July, most missed analysts’ estimates for August, and the annualized industry sales rate decelerated to the slowest in a year. The fear is that demand has peaked and will continue to dwindle in the absence of higher sales incentives. Sales in other countries have fallen as well, including in China, where increased tariffs and an escalating trade spat with the U.S. may be dragging on demand. Here’s a set of charts capturing the declines and looks at what’s behind them. Passenger-car sales in Asia’s second largest economy are down 3.4 percent during the first eight months of 2018 compared with the same period a year earlier. Japan’s rapidly aging population is contributing to more drivers giving up their licenses, while the costs of buying and maintaining a vehicle have led younger consumers to shun car ownership. Vehicle owners also are waiting longer to replace their rides, now taking an average of 7.7 years, according to a survey by the Japan Automobile Manufacturers Association. While Europe has been up overall, the region’s four largest auto markets — Germany, the U.K., France and Italy — recorded zero growth in the first six months of this year. And the situation looks worse for late 2018: Ernst & Young has warned that German car registrations will decline after August due to a new testing protocol that companies have been slow to adapt to. In the U.K., the Society of Motor Manufacturers and Traders warned against overconfidence. “It would be wrong to view the market as booming,” SMMT Chief Executive Mike Hawes said in a statement. Posted in News and tagged Auto Markets reaching the end of the road for growth, major carmaker posted declining U.S. deliveries, Recession in Car Industry, Reducing the Production of Vehicles, the world’s biggest auto markets.